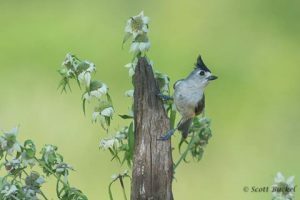 Black-crested Titmouse are cute little birds and they seem to be spunky. This little bird showed up late on my last day of shooting and for variety, we changed up the set ups and moved the flowers closer to the perch for a different look. I like the look and feel that the Bee Balm gives the overall feeling of this capture.